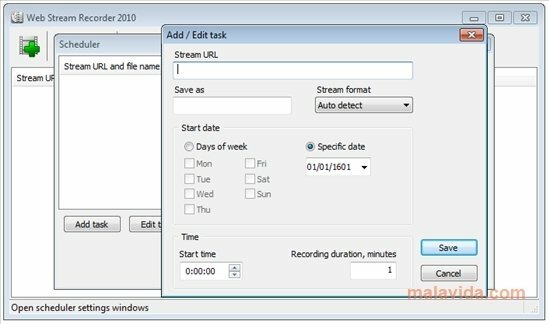 Web Stream Recorder is a software that allows you to record on your hard drive any streaming broadcast that you receive on your computer. Lately, it has become very common to use webcams to chat with friends and take part in more personal conversations. They are also very popular on social networks and instant messaging clients. If you ever want to record these video broadcasts, Web Stream Recorder is the software that will help you to perform the task. Recording a video stream is a rather complicated task, because you have to capture the broadcast the moment it is stored on your computer. For this purpose, Web Stream Recorder allows you to include the URL (or the folder) so that it can tune into the video itself and save it in a video file. Web Stream Recorder is capable of capturing two kinds of streams, “Stream on demand” that is the system used by sites like YouTube (you choose what you want to see) and “Live Streaming” in which you receive the video directly from a remote camera. This download runs on Windows 2000, XP and above. The trial version can be used for 7 days.